I woke up at 4:30 a.m. because my bedroom door was rattling. Now I could hear a really strong wind, which had shifted so it was coming from the south (correction, west; I’m notoriously directionally challenged) and hitting the window behind my bed. I could tell it wasn’t raining as much. I’d apparently slept straight through the worst part of Irene. I got up to see what was going on in the rest of the house. A very damp smell hit me when I opened the bedroom door and walked into the dining room (where the basement door is). There was still water in the basement, but the leaks appeared to be slowing. The attic leaks looked to have stopped completely. The wind was rattling the exterior cover of my bathroom vent quite loudly. Thankfully the power was still on. This led to a comedy of errors though because I had turned on the overhead light in my living room so that I could see. It’s operated from a remote control and though I was able to turn it on, the remote then stopped working. I tried using a remote for a similar fixture in the dining room. That turned on the dining room light, but then it also stopped working. 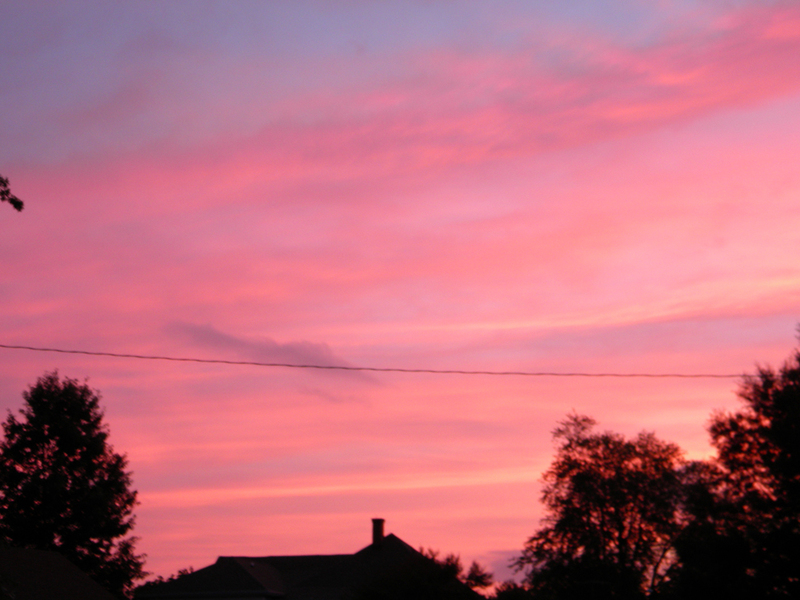 Now I had two blazingly bright lights on in my house at 4:30 a.m. and I just wanted to go back to sleep. I plucked a third remote from the wall in the guest room and removed its battery, swapping it out for those in the other two remotes in turn, which then allowed me to turn off those lights. Then I flopped back into bed. Just little branches fell on our street. I awoke again at 7:15. Very strong winds were once again causing my bedroom door to rattle. The screens in the windows were rattling too. 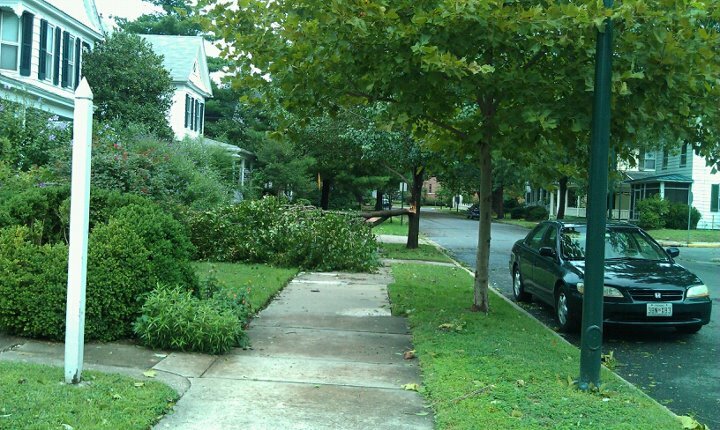 I chanced a peek outside and saw lots of small branches were down in the street. I got up and once again surveyed the various parts of the house. I took the big floor fan I’d purchased out of its box and set it up to start drying out the basement. I also set up the canisters of DampRid. Then I took the tower fan out of my bedroom and set it up downstairs as well, for good measure. Once it stopped raining and I saw folks venturing outdoors, I went out and picked up the largest limbs from my front yard. I took a quick walk around our block — the old oaks had dropped tons of small branches. Tree broken in half on Dover Street. I came back to my house and grabbed my phone and set off for a longer walk. It was still quite gusty. I took several pics of large limbs down along the way. 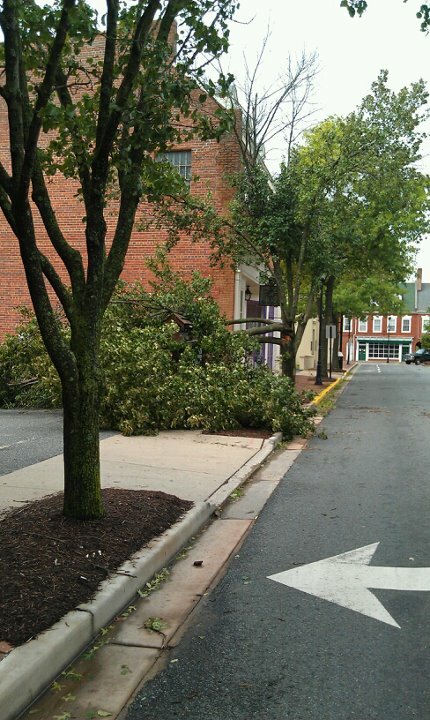 A large tree in front of the Inn at 202 Dover had broken in half. 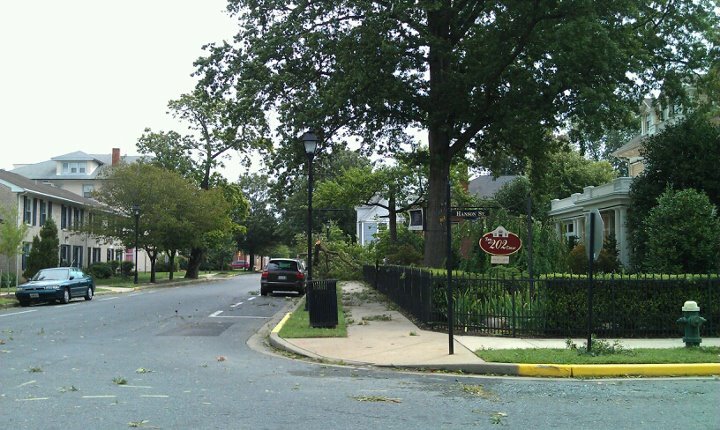 Large limb down on Goldsborough. When I got back to the house, I decided to use Febreeze in the living room and dining room to try and combat the damp smell. I emptied the cooler that had been storing ice, which was now mostly melted. Downstairs, I opened a small window to let still more air into the basement. It caused the basement door to rattle whenever a strong gust blew through. I began emptying the large plastic drawers filled with water that were in the tub. Then I folded the tarp in the living room and started moving my scrapbooks and documents back into the office, which fortunately did not leak. 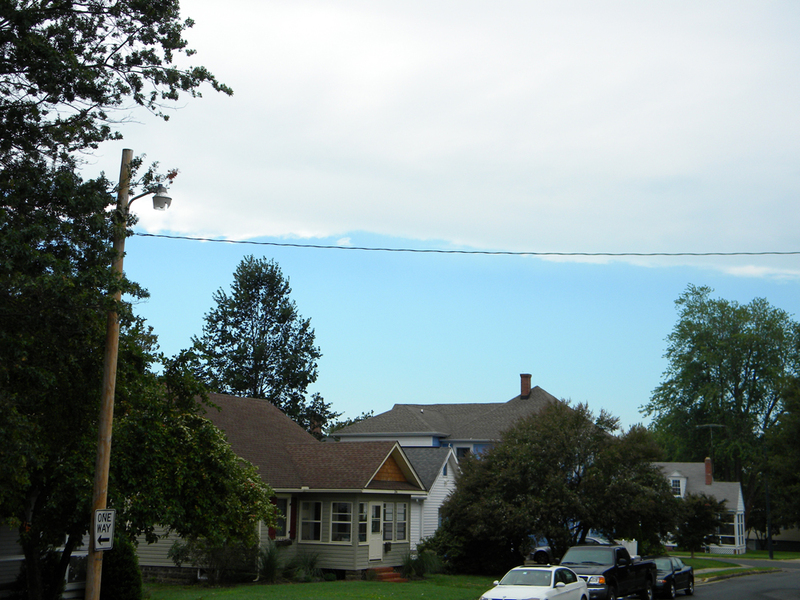 At 1:30 p.m., I spotted the first hint of blue sky since Friday. Shortly thereafter, the sun was out. I pulled my car out of the garage and then I went out back to get my composter out of the shed and wrestled it back into its frame. I re-hung the flag out front. After a trip to the gym, I was pleased to discover that the house no longer smelled like a swamp when I walked through the door. I’m contemplating returning the un-opened sub-pump and hose. Surely if the basement didn’t flood after nearly 9 inches of rain in less than 24 hours, I’m not going to need it, right? Later in the afternoon, all the neighbors were in their yards raking up the branches and leaves that had fallen. I opened all my doors and windows to let as much fresh air as I could into the house. I made another sweep of the sidewalk to get still more sticks out of the way. Everyone was saying how lucky we were that it wasn’t worse, even though we’d all prepared for it. I took another walk into town and noticed quite a bit of the damage that I’d seen before was already cleared away. Talbot County Schools are closed tomorrow, but everything should be back to normal after that (at least in our part of town). Good riddance, Irene! Woke up worrying about my water heater. It’s in the flood-prone basement too and while it’s raised up on cinderblocks, still susceptible to water if my basement really floods. It’s gas too, which kind of scares me, for all its normal convenience. On the advice of a friend, I called Easton Utilities and they assured me that it probably had an automatic shutoff mechanism should the pilot light extinguish. That made me feel better — I didn’t want to have to preemptively shut off anything if I could help it. Since it was just overcast and not actually raining yet, I ventured down to the open-air market. I wasn’t sure if it would be open and there were less than half the normal vendors (and those that were there weren’t set up as elaborately as they normally would be). I picked up some fresh veggies to have on-hand, a sugar waffle for breakfast and some smoked salmon salad for a sandwich for lunch. Soon after getting home, the rain started, lightly at first. I hurried to put my car in the garage and then I showered so I could try and fill the tub with water for later, in case I needed it. I also filled my largest pots on the stove with filtered drinking water. 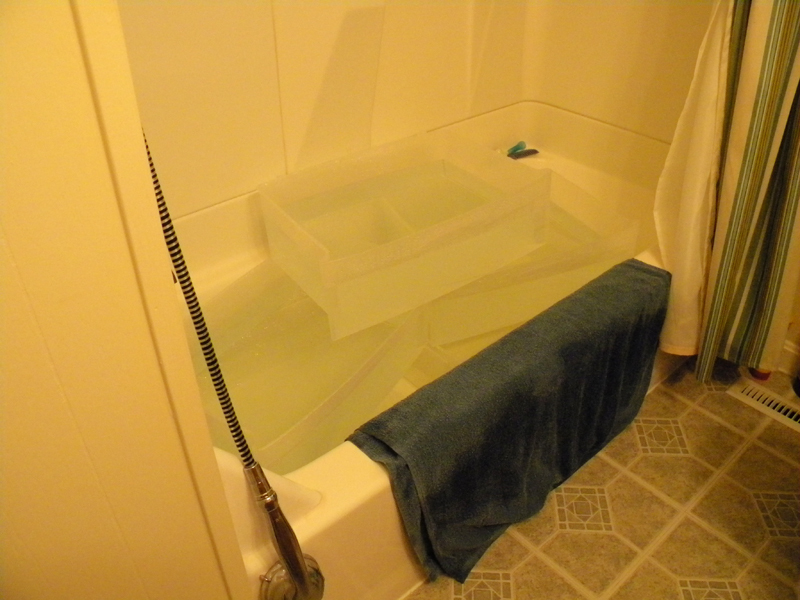 The only problem was that the tub kept draining. It doesn’t have a stopper — you pull up a lever that is supposed to close the drain. I tried setting a saucer over the drain, then a mug, then a bowl, then a towel covered by a bowl, then a canning lid covered by a towel weighted down by a bowl. It just kept draining. Creative water storage, crowd-sourced on Facebook. I crowd-sourced my problem on Facebook and received a number of suggestions including using cellophane and a potato. Finally, a friend suggested that I just fill the tub with other items filled with water. That set off a brainwave for me. I remembered these two storage units I bought at Walmart ages ago — they each have 3 huge plastic drawers. I emptied two of the drawers in the unit in my bathroom closet and filled them with water while I fetched the three drawers from the other unit, which was sitting empty in the attic. I was able to stack the filled drawers in the tub and felt much better knowing I had a stash of water for washing and for flushing the toilet, should it come to that. After checking on the chest freezer, I noticed that one of the bags of water I had put in the day before hadn’t frozen completely, so I cranked up the cold on that unit and on the fridge upstairs (that was actually a recommendation from one of the emergency management organizations I’d been following lately anyhow). I also cranked up the a/c and turned on all the ceiling fans on high. If the house lost power, I wanted it as cold as possible. At around 1:30 p.m., the radio station in Annapolis that I was listening to (WRNR) was knocked off the air because the City Dock area lost power. I switched over to WCEI here in Easton, which was providing regular updates from around the area. I checked outside and noticed at least an inch of standing water on the sidewalk out front. There wasn’t any water in the basement yet, but the wind and rain really started to pick up then. There were several rivulets in the basement just a couple of hours later (and a trickle running down my chimney in the attic). By that point, we’d had over 3 inches of rain in Easton. I kept a close eye on the Internet for weather and local updates. 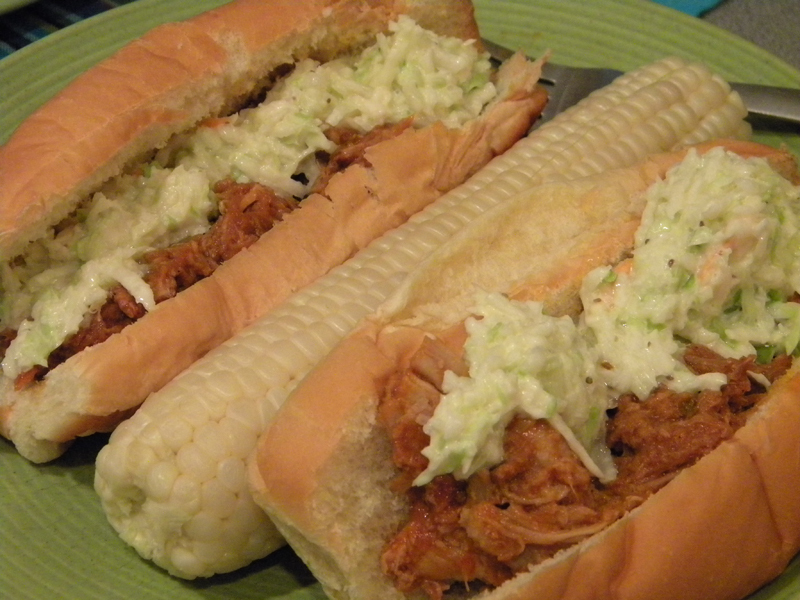 I heated up some of the Amish pork bbq for dinner and had it with coleslaw and corn on the cob (bought at the market that morning). And beer. I was strategically working my way through the beer in the fridge, in case power was lost. Then I could tap the wine stash. The weather continued to get nastier and nastier. The puddles got bigger down in the basement, but there wasn’t a deluge, as I had feared. The chimney started leaking on three sides in the attic and also was leaking at its base down in the basement. I knew it needed a new cap, but the flashing would need to be looked at too. Thankfully, I still had power. The lines on my street are buried. 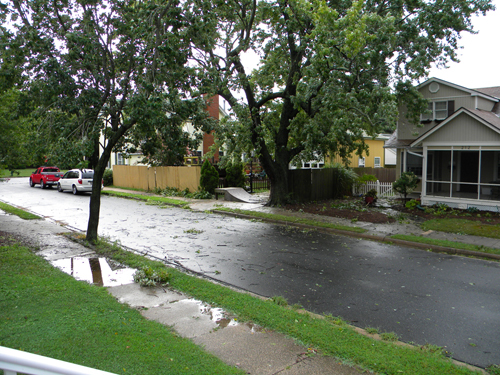 The last time our power went out, lightning struck something in the area and we were in the dark for several hours. I was bracing myself for a similar situation, which didn’t transpire. At around 10:30 p.m. I was pretty exhausted and started to get ready for bed. I didn’t think I’d be getting much sleep — all reports indicated the worst was yet to come. I unplugged everything and stowed the computers and chargers under the tarp in the living room. I took my cell phone into the bedroom with me and also pulled in my extra jugs of water and food bag. I’d read that you’re supposed to close all of your interior doors at the height of a storm. I suppose that’s so if a room sustains damage, the wind and water will hopefully stay contained in that room. After closing the door to my room, I couldn’t hear much of what was going on outside, thankfully. The overhead fan also was helping to drown out the noise of the wind and rain. I had debated sleeping in a different room because there is a window at the head of my bed, but the really bad stuff was coming from a different direction. I figured I’d be okay. I woke up once before midnight — I can’t remember what woke me up, but I went back to sleep shortly thereafter. 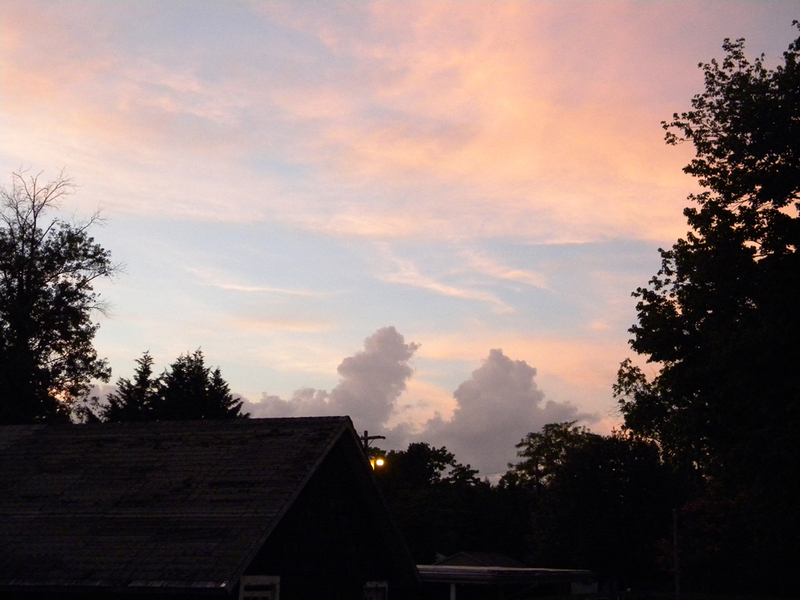 Clouds creeping into the area on Friday night. I worked from home and took breaks to get still more things squared away for the hurricane. One of the first things I did was head back to Target at 9 a.m. because I realized I hadn’t gotten enough C batteries for my radio. Well, they’d since been cleared out. I picked up a couple other items and then headed to Lowes, hoping for better luck. Lowes had a huge battery display near the registers, but there weren’t any Cs there. I did find a few packages at the customer service counter. I bought enough batteries to power my radio two times through. 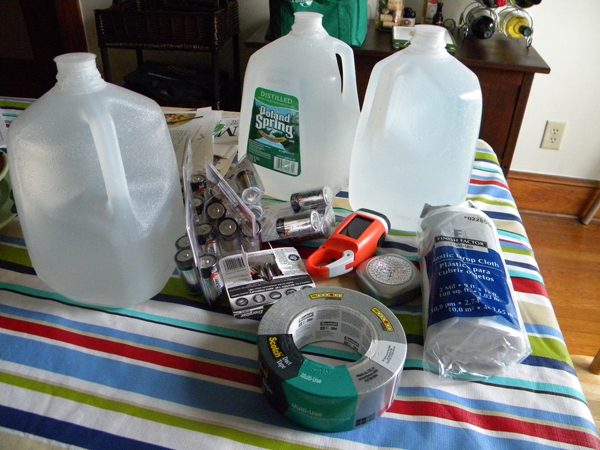 I also bought DampRid canisters in anticipation of a soon-to-be-damp basement. I contemplated picking up a high-power fan too, but decided I’d return for that later (my hands were full). Upon returning home, I plugged in both my personal and work laptops and began charging my phone off of the personal laptop. I figured that if the power went out, I could continue to charge the phone from both laptops. I also emptied my ice maker into my cooler for the first time. I brought up my cleaning bucket from the basement to fill with water later. Around lunchtime, I moved all of my dear-to-me scrapbooks out of my office (an old porch I was afraid would be more prone to leak), along with my fire safe and important papers. These I arranged in the middle of my living room floor to be covered with a tarp later. 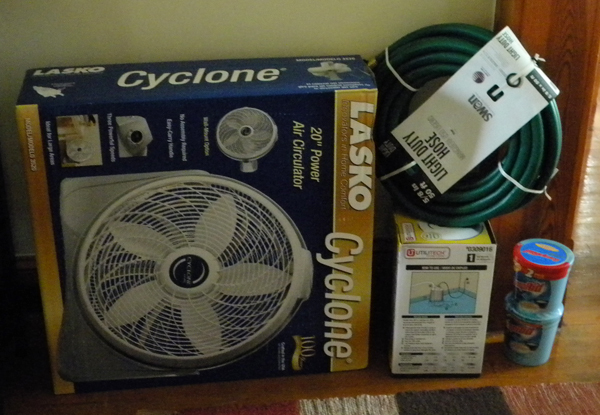 After work, I went back to Lowes and bought a huge floor fan, a sub pump, a 50-foot hose to drain from the basement to the street using the sub pump, and said tarp for the living room. While I had my provisions in case of a power outage, I needed some real food too, to get me through until the power was out. So, next I went to the Amish market. The bakery was completely wiped out. I bought one of the remaining two bags of hot-dog buns for the bbq I purchased for dinner over the weekend. I bought some snacks as well — yogurt and kettle corn. While I was pulling my purchases out of the car, I chatted with some of my neighbors. One of them was pulling his tomato and pepper plants (in pots) into his house — they were all bearing fruit that would have been ruined (not to mention the plants themselves could have become missiles in the wind). The other neighbor had moved a boat normally parked by his house around the corner, where it wouldn’t be as close to trees. His kids seemed excited by the upcoming storm. Everyone was upbeat but somewhat resigned to whatever was coming our way. Before leaving, I had begun backing up my laptop. While I waited for that to finish up, I did the dishes in the sink and ran the dishwasher. After that finished running, I did two loads of laundry and then unplugged the washer and dryer. On the advice of a friend, I started filling large ziploc bags and tupperware containers with water and these I started stowing in my kitchen freezer and my chest freezer downstairs. The idea being that the more full your freezer is, the cooler it will stay if the power goes out. I also filled two thermoses with filtered drinking water and put them in the fridge to cool. 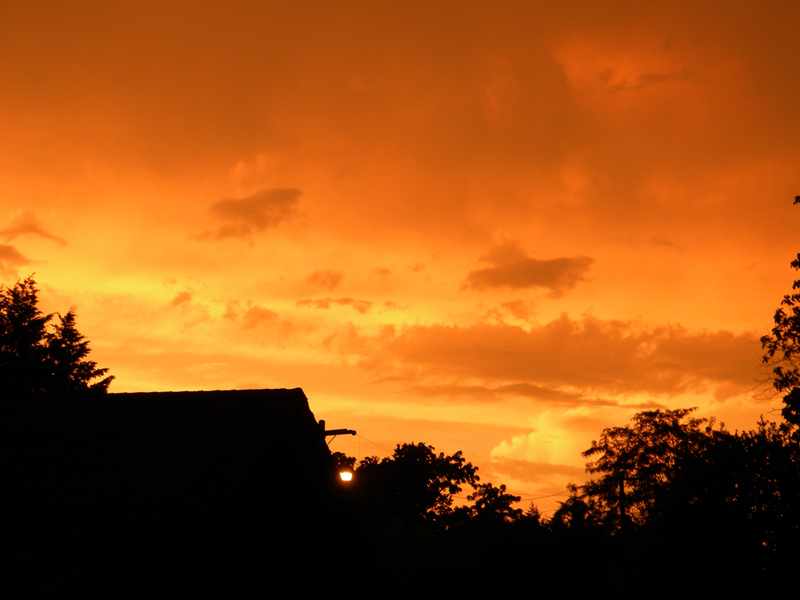 Rainy/fiery sunset on Thursday, Aug. 25. The warnings became more dire and Ocean City (about an hour away from me) was ordered evacuated by 5 p.m. Friday night. On my way home from work, traffic heading west on Route 50 was heavy, but it also was slow eastbound, which I chalked up to folks driving to the coast to check on properties before the storm. I saw extra MTA buses heading to Ocean City to aid in the evacuation. I also saw idiots headed in the same direction with bikes and kayaks strapped to their cars. Target was out of 1- or 2-gallon jugs of water and I hated the idea of buying so many small bottles. I went back to Railway Market, where I’d done my food shopping the night before, and bought 3 1-gallon jugs. They say each person needs 1 gallon per day and they recommend a 3-day supply. When I got home, I noticed my neighbors pulling in items from their backyard and started doing the same in mine. I pulled my empty garbage cans into the garage, leaving room to pull in my car later. I also took down a flag and pole hanging from my front porch and stowed these in my shed. Then I had my composter to deal with. I thought it would be a simple matter of dragging it into the shed too, but the handle I use to spin the bin made it just too wide to fit through the door. It was starting to rain at this point (not hurricane-related yet). I ran inside to grab a wrench and pliers and started to disconnect the bin from the frame. Luckily, the bin wasn’t anywhere near full, so I was able to lift it into the shed and then the frame fit in easily after that. I did acquire a massive bug bite in the process.